My my, how fall has flown. When we left work today (in the dark!) we counted the days — just over a few weeks until Thanksgiving. Whether you’re preparing a feast for your family or are looking for a fabulous option for ‘Friendsgiving’, these creative Seen on Pinterest takes on Thanksgiving favorites are sure to be a huge hit. Start light with this turkey themed crudite platter. Ginger spices up your traditional cranberry sauce routine. Can’t decide on potatoes? Dig the swirl. 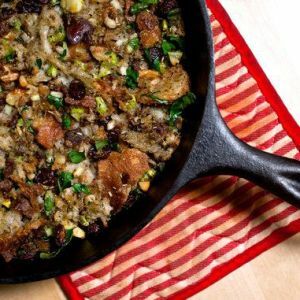 Marilyn Monroe loved this stuffing. You will too. Cinnamon pecan crunch replaces marshmallows in this ‘sweet’ updates. Green bean casserole gets a fresh update. Coffee + pumpkin + chocolate = these delicious muffins. Ricotta lightens up this delicious cheesecake. Swap apples for persimmons in this crumble-topped treat.